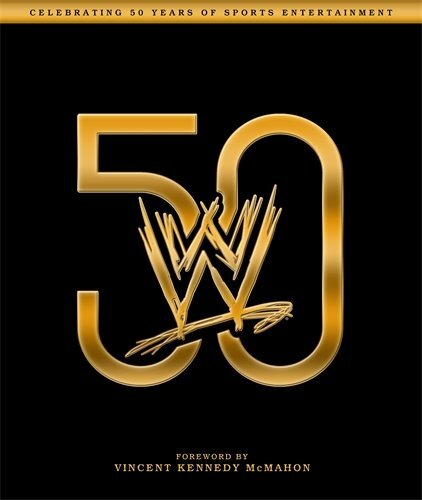 Book Review: ‘WWE: Celebrating 50 Years of Entertainment’!! If you’ve ever been a fan of professional wrestling, whether it be the WWE, WCW, or ECW, then ‘WWE 50‘ is one hardcover coffee table book you should purchase. 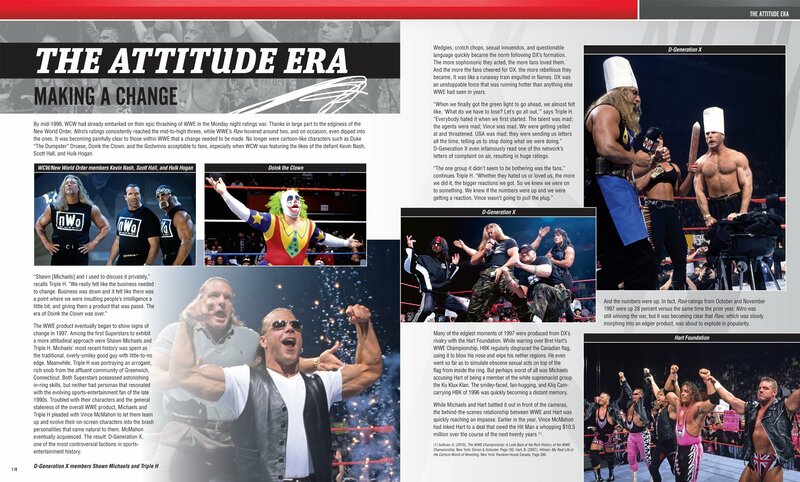 It literally spans the entire history of the WWE, with excellent articles, facts about wrestlers, commentaries, and gorgeous images from the past several decades on your favorite brand of sports entertainment. I recently reviewed the Blu-ray ‘WWE: History of the WWE‘, which you can read HERE. This book though, is an excellent companion piece to that Blu-ray, although you don’t necessarily need both to enjoy, although I recommend it. And if you were thinking of getting this for your Kindle, iPad, or Nook, I highly suggest you forgo that option and spend the extra few dollars on the physical hardcover copy (both of which are under $20) of the book, due to its impressive high-res, gorgeous images of all of your favorite wrestlers and matches. The inside of the hardcover has every poster of every pay-per-view match in WWE History, which is very cool. Being able to attend some of these pay-per-views, drew up on some good memories. The book starts out with Vince McMahon Sr. trying to promote his wrestling franchise as we get to see tons of old school photos of that time period along with his team up with the excellent Bruno Sammartino. In the Blu-ray documentary I mentioned above, this time period is only touched on, but here in the book, it has a ton more details and dirt on the execs and wrestlers. Then of course Hulk Hogan came aboard and changed the game forever and brought WWE (or WWF back then) into the mainstream spotlight. There are some good interviews and quotes from Gorilla Monsoon and Billy Graham on the evolution of the business here as well that might make you laugh. And we all know that WWE now owns WCW, but at one point they were bitter rival companies. And in this book, there is an excellent graph of how many viewers and ratings each franchise had through the years. 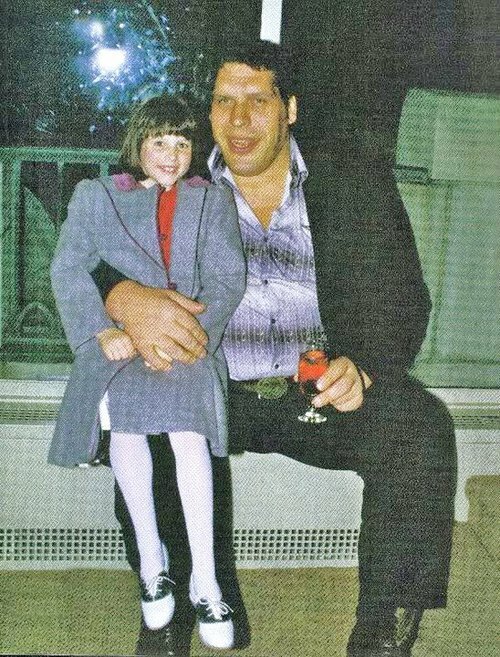 The big rival matches and epic story feuds are talked about from both sides of the spectrum here, along with some great photos, one of which is of a 10 year old Stephanie McMahon sitting on Andre the Giant’s lap. Paul Heyman and Vince Russo are given some time to shine in this book too as they talk about ECW and the general writing of the show, and how it’s changed over the years. Towards the end of the book, we get an in depth look at some of the movies, tv shows, and promo products that the WWE has produced over the years including the failed XFL league and Vince McMahon Jr’s bodybuilding enterprise. No matter if you were once a fan or still rabid fan like myself of the WWE, this book is OUTSTANDING and is a must-own. The Ultimate ‘Andre The Giant’ Documentary Is Finally Happening! This entry was posted on Friday, July 25th, 2014 at 11:45 am	and is filed under News. You can follow any responses to this entry through the RSS 2.0 feed. You can skip to the end and leave a response. Pinging is currently not allowed.